Silent infections earlier in life could be at the root of Alzheimer’s disease. Alzheimer’s researchers have long presumed that amyloid beta proteins are the brain’s garbage, accumulating over time but serving no obvious purpose. These plaques trigger the formation of tau proteins (or “tangles”), which proceed to destroy nerve cells. Robert D. Moir of Harvard Medical School and Massachusetts General Hospital thought something was missing in this picture—and looked to proteins that live on our innate immune system for answers. Moir and his colleague Rudolph E. Tanzi noticed that amyloid proteins look like these immune system proteins, which trap and then purge harmful viruses, yeast, fungi, and bacteria. The two scientists wanted to see if amyloid plaques serve a similar function in the brain. 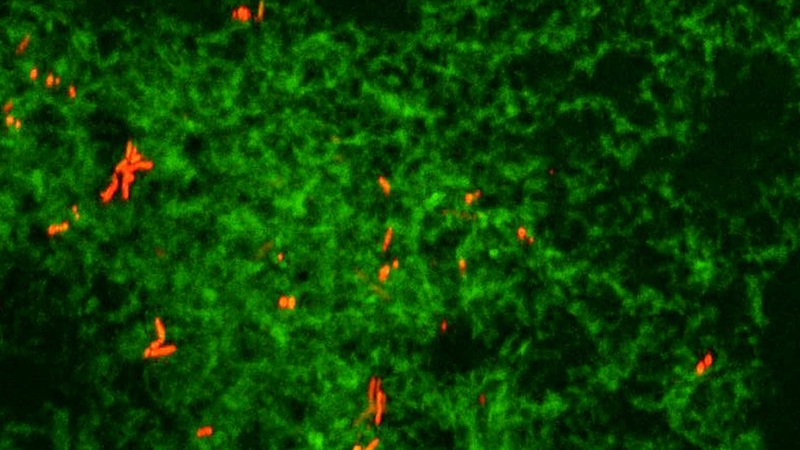 Salmonella bacteria, trapped in amyloid beta plaques. In one experiment, Moir and Tanzi subjected young mice’s brains to Salmonella bacteria. They noticed that plaques began to form around single Salmonella bacterium and that in mice without amyloid beta, bacterial infections arose more quickly. The team’s work, published* Wednesday in the journal Science Translational Medicine, suggests that silent, often symptomless infections in the brain could be the precursor to the development of Alzheimer’s disease later in life. “The Harvard researchers report a scenario seemingly out of science fiction. A virus, fungus or bacterium gets into the brain, passing through a membrane—the blood-brain barrier—that becomes leaky as people age. The brain’s defense system rushes in to stop the invader by making a sticky cage out of proteins, called beta amyloid. The microbe, like a fly in a spider web, becomes trapped in the cage and dies. What is left behind is the cage—a plaque that is the hallmark of Alzheimer’s. So far, the group has confirmed this hypothesis in neurons growing in petri dishes as well as in yeast, roundworms, fruit flies and mice. There is much more work to be done to determine if a similar sequence happens in humans, but plans—and funding—are in place to start those studies, involving a multicenter project that will examine human brains. Of course, infection is likely not the only contributing factor. People with the ApoE4 gene aren’t as effective in breaking down beta amyloid, so any potential immune-like response by amyloid proteins could lead to an unhealthy buildup. Whatever the complex set of circumstances may be, this finding may fill in some of missing links in Alzheimer’s research.